Fizz and Bubble is a new brand to me that prides themself on their signature 8-oil blend in all their products. Being a bath fanatic, I could not wait to try out these guys. All Fizz and Bubble products can all be found at Ulta and Ulta.com. Lavender Field Bubble Bath Milkshake comes with about 10-15 mini bath bombs and a small purple loofah. This would make a great gift idea if you have a younger sister/niece/friend in your life. Click on the link to see the packaging and you will know why. I put about 3-4 of these in the bath at a time and they immediately started to fizz. The lavender scent is nice and not too overwhelming. These are the more traditional 'bath bomb' that I am used to. The Coconut Cream is my favorite out of the two because it has a warm cozy scent. The coconut scent reminds me of vanilla which is my favorite bath scent. The Rainbow Sherbet is a bit too sweet for my liking. Both contain epsom salts so they fizz up greatly in the bath. The result is a foamy layer over the top of the water-nothing too bubbly. These are both free of chemicals, eco-friendly, and not tested on animals. 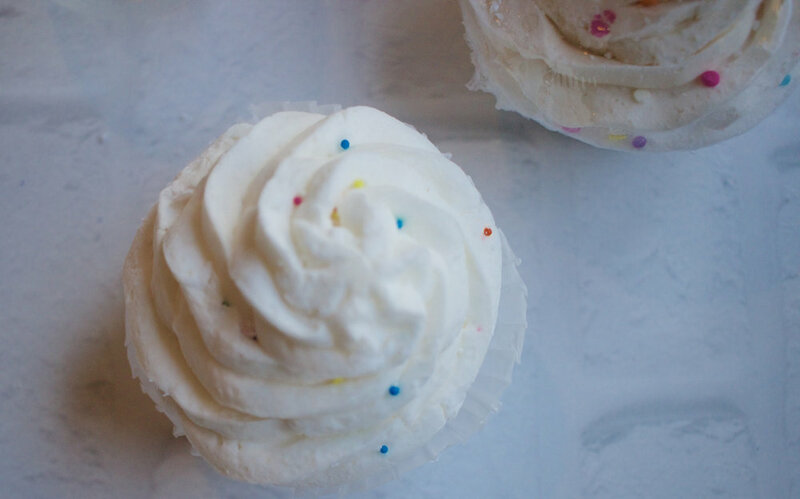 These are the Birthday Cake Bubble Bath Cupcake. The bottom of the cupcake is activated by simply placing in the water and the top can be rubbed in your hands under the water to create the bubble bath. These are not too sweet smelling, and fun to use. The top 'frosting' is more moisturizing I found which was a nice surprise. These all dissolved well and did not leave any residue in my bathtub. I really liked trying a new brand of bath bombs as I have been stuck to buying Lush products for so long. However, I think Lush is still the front runner when it comes to bath bombs. What bath products are your favorite?